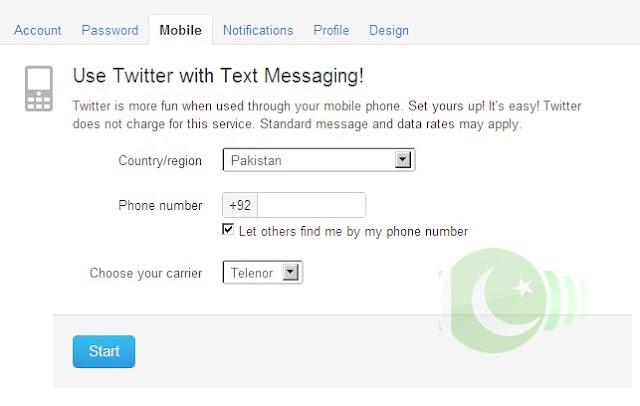 Telenor Pakistan's Pre-Paid and Post-paid users will now be able to operate Twitter through their Telenor on 40404 SMS Short Code. Twitter offers social networking and Microblogging service, enabling its users to send and read messages called tweets. 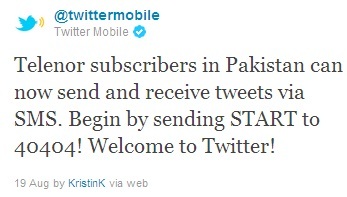 Telenor now offer its subscribers to send, receive unlimited tweets through this service. Telenor subscribers in Pakistan can now send and receive tweets via SMS. Begin by sending START to 40404! Before you Start, create a account on Twitter and SMS “start” to 40404. Enter username, It is important to send username only if there are any additional characters in the message we will not be able to read it correctly. To get others' updates delivered to their phone, you have to turn on mobile updates for Tweets you wish to see on your phone. Until you do this, you will not receive any Tweets to your mobile phone. Check out these other phone commands for more tips and tricks! Further phone commands are listed below to maneuver account. OFF: turns off all updates except direct messages. Send STOP again to turn off direct messages too. STOP, QUIT, End, Cancel, or Unsubscribe: turns ALL phone notifications off. FOLLOW username: this command allows you to start following a specific user, as well as receive SMS notifications. Example: FOLLOW PakistanPk, or f Pakistanpk for short. LEAVE username: this command allows you to stop receiving SMS notifications for a specific user. Example: LEAVE PakistanPk, or l PakkistanPk for short.